Since 2016, Thailand Pesticide Alert Network (Thai-PAN) has been campaigning with researchers in the fields of public health and the environment, the Alternative Agriculture Network, the Food Security Network, and the Foundation for Consumers to raise awareness about the dangerous long-term and short-term impacts of chemicals used in agriculture on human health and the environment. These groups are working together to push for an outright ban on the two dangerous chemicals paraquat and chlorpyrifos, and for regulation of where the chemical herbicide glyphosate can be used. The focus is on these particular chemicals based on their impacts on human and environmental health. Banning paraquat is particularly urgent because of its high toxicity. This herbicide is already banned for use in 53 countries, including Switzerland, its country of origin, and China, the world’s largest manufacturer of paraquat. Chlorpyrifos is also a priority because it has been linked to developmental delays in infants and young children. Chlorpyrifos residues have been found regularly in a wide variety of fruit and vegetables produced in Thailand. As for glyphosate, this chemical has been identified as a likely carcinogen based on a review of the evidence by the International Agency for Research on Cancer (IARC). Though many countries worldwide have already banned or at least regulated the use of these three chemicals, in Thailand the agencies with the power and responsibility to regulate these toxic agri-chemicals have so far failed to do so. Strong statements in favor of regulation have been issued by the Ministry of Public Health, academic researchers, and Thai civil society organizations, citing published evidence of the negative impacts of these chemical pesticides. Despite this situation, the government has not acted. Companies that make huge profits from importing these agri-chemicals have become part of the government’s decision-making process. Their interference in policy-making is blocking progress in regulating these three chemicals in Thailand. The careless and un-participatory nature of policy-making in this area is therefore being laid bare. The responsible parties do not appear to care enough about for the safety of the public nationwide. Moreover, certain activists and researchers who present the facts about the risks associated with toxic chemical use have been the target of threats and intimidation from groups benefiting from the import of dangerous agricultural chemicals. In the latest example, a researcher who has worked with the Thai-PAN network, Associate Professor Puangrat Kajitvichyanukul, is being pressured to resign from her position at Naresuan University after sharing her research findings about persistence of paraquat in the environment. Dr. Kajitvichyanukul is the Director of the Center of Excellence on Environmental Research and Innovation (CERI), Faculty of Engineering, Naresuan University. She received the Outstanding Researcher Award from the Thailand Research Fund in 2014 and the Distinguished Researcher Award from Naresuan University in 2011. Nevertheless, groups associated with agrichemical corporations are trying to have her removed from her position. On 25th January 2018, a group using the name of “Federation for Safe Agriculture,” a front group for agrichemical companies, made a statement calling for Dr. Kajitvichyanukul’s resignation from Naresuan University. In this statement, the group pressured the Chancellor of Naresuan University to terminate Dr. Kajitvichyanukul’s contract by the end of March 2018, claiming that she had acted unprofessionally. At the same time, the group called for the Ministry of Public Health to withdraw its recommendations both to ban the chemicals paraquat and chlorpyrifos and to regulate the chemical glyphosate. These actions constitute a serious threat to the work of an independent researcher using her scientific expertise in service to society. Dr. Kajitvichyanukul’s research was carried out following a request by communities in the north and northeast of Thailand. Currently, civic groups and the public are working to show their collective support and encouragement for Dr. Kajitvichyanukul. They are also calling for anyone involved to reveal any conflicts of interest, or any instances of corporations with financial interests interfering in the policy making processes around banning and regulating dangerous chemicals. As a result of the public campaign and a steady expansion of the scientific evidence on the impacts of toxic chemicals, the Ministry of Public Health under the leadership of Dr. Piyasakol Sakolsatayadorn formed a committee specifically to discuss the issue of chemical residues found in fruits and vegetables. This Task Force on the Use of High-Risk Agrichemicals is composed of officials and experts from four main ministries: the Ministry of Agriculture and Cooperatives, the Ministry of Natural Resources and Environment, the Ministry of Industry, and the Ministry of Public Health. Researchers in the areas of public health and the environment also participated in the task force, including representatives from Thai-PAN. The task force met on a monthly basis to review and discuss important information about pesticides relating to seven areas: imports, nationwide distribution, benefits of applying chemicals, negative impacts of chemicals, economic costs, impacts on the health of the Thai people, and alternative solutions in cases where chemicals are banned or strictly controlled. Paraquat: Based on a review of the scientific evidence1 from various sources by Thai-PAN and other networks of researchers, paraquat is a chemical with high acute toxicity for which there is no known treatment. Coming into contact with paraquat by ingestion or through the skin can cause death; dermal contact can also cause skin conditions. Moreover, paraquat can damage the nervous system, and exposure to paraquat has been linked to development of Parkinson’s disease. Chlorpyrifos: Based on a review of the scientific literature1, various studies indicate that chlorpyrifos exposure effects child development. Papers published in international journals show that prenatal exposure to chlorpyrifos carries risks for the developing fetus. Specifically, this type of exposure can cause pervasive developmental disorders (PDD). Chlorpyrifos has been found to act as an endocrine disruptor, meaning that it interferes with the body’s hormone system in ways that can lead to negative health impacts. Furthermore, some studies associate chlorpyrifos exposure with increased risk of colon cancer. These risks from chlorpyrifos are a major concern in Thailand, as multiple reliable surveys on pesticide residues in fruits and vegetables have identified chlorpyrifos as the most frequently detected chemical insecticide residue. For example, research carried out by the Faculty of Medicine at the University of Phayao involved analyzing vegetable samples from 27 farms, 106 markets, and one supermarket in the area around Phayao Lake from August to September 2013. The chemical residue most commonly found in the sampled vegetables collected from the farms was chlorpyrifos. Likewise, a study from Mahidol University in 2015 tested 117 cauliflower samples from markets in Nakhon Pathom Province for chemical residues that exceeded the maximum residue limit (MRL). The analysis identified chlorpyrifos residues in 34 samples (29%), in addition to contamination from other chemicals. These results are consistent with Thai-PAN’s own annual surveys of chemical residues, which likewise found chlorpyrifos to be among the top three most commonly identified insecticide residues in fruit and vegetable samples over the last three years. Glyphosate: In 2015, the International Agency for Research on Cancer (IARC), which is under the World Health Organization (WHO), issued a report designating glyphosate as “probably carcinogenic to humans” after a review of the existing evidence. IARC reached this conclusion based on the existence of sufficient evidence pointing to glyphosate being a cancer-causing agent in laboratory animals as well as strong evidence that glyphosate causes genetic disorders. Moreover, glyphosate has been linked to elevated risks for various diseases including diabetes, obesity, and Alzheimer’s disease and has been found to be toxic to human placental cells. After several rounds of meetings and after inviting researchers from various institutes to give inputs, the Task Force on the Use of High-Risk Agricultural Chemicals undertook a careful review of the evidence. One of the outcomes was a recommendation to stop the use of the herbicide paraquat and the insecticide chlorpyrifos within two years (by the end of December 2019). As for glyphosate, the task force suggested regulatory measures based on the fact that more glyphosate is imported into Thailand than any other agrichemical and it has been classified by WHO as a chemical that likely causes cancer in humans. Specifically, the regulations would prohibit the use of glyphosate in areas near water springs, forests, public spaces, waterways, water sources, and communities – especially near schools, daycare centers, and hospitals. Dr. Piyasakol Sakolsatayadorn of the Ministry of Public Health made the statement himself on 5th April 2017, pointing out that this recommendation constituted an effort to protect the safety of farmers and consumers and of the environment by preventing risks from toxic chemicals. He explained that banning the herbicide paraquat, of which over 30 million kilograms are imported each year into Thailand, would help to prevent farmers’ contact with this chemical that is associated with Parkinson’s disease and can cause skin diseases, ailments of the nervous system, and even death. Regarding chlorpyrifos, Dr. Sakolsatayadorn discussed how residues of this chemical are commonly found in fruits and vegetables in Thailand. He pointed out that various countries worldwide have already banned or regulated the use of chlorpyrifos on food crops because of its permanent negative impacts on the cognitive development of infants and fetuses. Through the Ministry of Public Health’s statement, the effort to ban and regulate use of these three toxic chemicals was near to accomplishing its goal. The Ministry recommended that new products containing these chemicals should not be eligible for registration, and products already registered should not be accepted for renewal or should be actively deregistered. Imports of paraquat and chlorpyrifos would end in December 2018 so that state institutions, traders, and farmers would have sufficient time to find alternative options to these chemicals and to manage products already on the market. At the end of December 2019, the use of both chemicals in Thailand would be banned. Since then, agrichemical companies and their supporters began their own activism in opposition to the recommendation by the Ministry of Public Health, working to hinder the discussion and impede proceedings. A group using the name “Federation of Safe Agriculture” seems to have been established with the support of agrichemical companies in order to forward their agenda. This group, which was never previously listed in the directory of agriculture-related groups and organizations in the country, popped up shortly after the Ministry of Public Health issued its recommendation to ban these high-risk toxic chemicals in April 2017. Since that time, the mass media and the general public has begun to see this group standing alongside the chemical companies at various events, supporting them in fighting against the banning and regulation of chemicals in Thailand. When people in 50 provinces of Thailand came out onto the streets on 19th September 2017, calling on the Prime Minister and provincial governors to take a stand on banning paraquat, the agrichemical companies and their supporters responded immediately. The Executive Director of CropLife Asia issued a statement accusing Thai-PAN of spreading misinformation about the toxic chemicals in question, despite not citing any evidence to support his claims. Members of CropLife include eight important agrichemical corporations: Syngenta, Monsanto, Dow AgroSciences, Bayer, DuPont, BASF, FMC Corporation, and Sumitomo Corporation. These eight giant international companies control over 80% of the global agrichemicals market. Moreover, on 21st September 2017 the front organization Federation of Safe Agriculture issued a false statement about the impacts on farmers entitled: “production costs of 70,000 million baht: don’t push this burden onto farmers” without any supporting evidence or reference documents. Most recently, they began to pressure the Ministry of Public Health to rescind its recommendation on banning and regulating the chemicals while also using intimidation tactics against Dr. Kajitvichyanukul, threatening academic freedom. The steps towards ending the use of these agricultural chemicals involve the Ministry of Agriculture and Cooperatives, which has the responsibility for agri-chemicals registration. The Ministry of Public Health made its recommendation directly to the Hazardous Substances Control Bureau, an agency of the Ministry of Agriculture and Cooperatives. 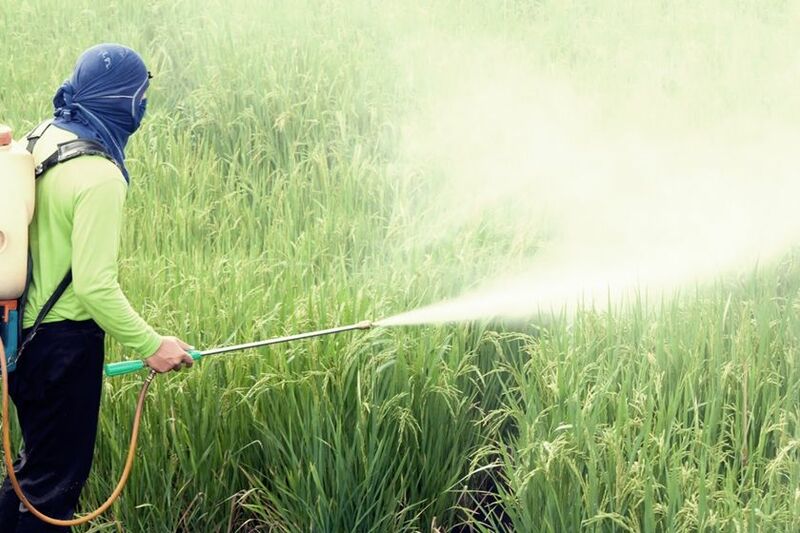 In the case of paraquat and chlorpyrifos, these two chemicals are currently pending for classification as Hazardous Substance Type 4 under the Thai legislation. If so classified, the possession or distribution of these chemicals would be strictly prohibited. The Ministry of Public Health recommended that glyphosate retain Type 3 classification but proposed additional restrictions regarding where it can be used. The Ministry of Agriculture and Cooperatives’ Department of Agriculture has the authority according to Article 25 of Thailand’s Hazardous Substances Act to take a decision not to register a particular chemical or not to renew a chemical’s registration. Even if a chemical is not classified as Type 4, the Department can refuse to register or to renew the registration for a chemical on grounds that it may be dangerous to plants, animals, humans, and/or the environment. This action would ensure that the chemical is not permitted to be produced in, imported to, exported from, or kept in possession in Thailand. Likewise, the Ministry of Agriculture and Cooperatives has the duty to provide information and advice to the Hazardous Substances Control Bureau, which in turn uses its authority according to Articles 18, 38, and 40 of the Hazardous Substances Act to classify the chemical. Once the Hazardous Substances Control Bureau classifies a substance as Type 4, the production, import, export, or possession of the chemical in question is prohibited. In this case, however, just before the registration status of both paraquat and chlorpyrifos was to expire in November, the Ministry of Agriculture and Cooperatives did not follow the normal legal procedure. The registration of paraquat and chlorpyrifos were proposed for extension even though at that time they were still under consideration for classification as Type 4 by the Hazardous Substances Control Bureau. In the month of October, there was massive public concern about the potential prolongation of these chemicals’ registration. Nevertheless, Mr. Chatchai Sarikalya, the Minister General, and Mr. Suwit Chaikiattiyos, Director-General of the Department of Agriculture both granted permission to the agri-giant company Syngenta to re-register paraquat in November 2017. Subsequently, other companies have been permitted to register products containing both paraquat and chlorpyrifos. In taking this action to allow registration, Mr. Sarikalya and Mr. Chaikiattiyos showed their indifference to the voices of the Thai people and ignored the evidence indicating the negative impacts of paraquat and chlorpyrifos. When the Hazardous Substances Control Bureau met in December 2017, it was announced that its decision on whether or not to ban paraquat and chlorpyrifos and to impose restrictions on the use of glyphosate would be completed within three months. Following this timeframe, the Bureau should have revealed its decision by March 2018, but will likely reach a conclusion within April 2018 instead. By law, an Advisory Committee within the Hazardous Substances Control Bureau is the decision-making body in terms of banning the two chemicals paraquat and chlorpyrifos. The committee is composed of ten members (current members were appointed in May 2017), with five posts reserved for representatives of nonprofit organizations with a focus on issues related to health, consumer protection, sustainable agriculture, hazardous materials, or the environment. Two of these five posts, however, have in fact been occupied by individuals from the Chemical Trade Association, a group whose principal members are importers and distributers of paraquat, chlorpyrifos, and glyphosate. Even aside from these two Advisory Committee members, other individuals and groups in the Ministry of Agriculture have close relations with these large agrichemical companies as well. The list of the members of the Hazardous Substances Control Bureau as a whole indicates overlapping interests of the state and the corporations who profit from imports of dangerous chemicals. This issue highlights the need for close monitoring regarding conflicts of interest. In this situation, individuals who have a commercial stake in the question of banning and regulation of these chemicals now have the power to influence the decision-making process directly. This decision will impact the health and well-being of people across the country, and the lack of transparency in the process so far is a major concern. We must therefore watch closely as the Bureau considers this decision. While these dangerous chemicals pose great risks to human and environmental health, the giant companies continue to profit off the sale of these hazardous substances, while hiding behind the argument that farmers supposedly need such chemicals. Baharuddin MRB, Sahid IB, Noor MABM, Sulaiman N et. al. Pesticide risk assessment: A study on inhalation and dermal exposure to 2,4-D and paraquat among Malaysian paddy farmers. Journal of Environmental Science and Health 46:7, 2011. Callahan CI, Hamad LA, Olson JR, Ismail AA et. al. Longitudinal assessment of occupational determinants of chlorpyrifos exposure in adolescent pesticide workers in Egypt. International Journal of Hygiene and Environmental Health 220, 2017. Gawarammana IB, Buckley NA. Medical management of paraquat ingestion. British Journal of Clinical Pharmacology 72:5, 2011. Hertzman C, Wiens M, Bowering D, Snow B et. al. Parkinson’s disease: A case-control study of occupational and environmental risk factors. American Journal of Industrial Medicine 17:3, 1990. Lee WJ, Blair A, Hoppin JA, Lubin JH, et. al. Cancer Incidence among Pesticide Applicators Exposed to Chlorpyrifos in the Agricultural Health Study. Journal of the National Cancer Institute 96:23, 2004. Myers JP, Antoniou MN, Blumberg B, Carroll L et. al. Concerns over use of glyphosate-based herbicides and risks associated with exposures: a consensus statement. Environmental Health 15:19, 2016. Parvez S, Gerona RR, Proctor C, Friesen M, et. al. Glyphosate exposure in pregnancy and shortened gestational length: a prospective Indiana birth cohort study. Environmental Health 17:23, 2018. Silver MK, Shao J, Zhu B, Chen M et. al. Prenatal naled and chlorpyrifos exposure is associated with deficits in infant motor function in a cohort of Chinese infants. Environment International 106, 2017. Viswanath G, Chatterjee S, Dabral S, Nanguneri SR et. al. Anti-androgenic endocrine disrupting activities of chlorpyrifos and piperophos. The Journal of Steroid Biochemistry and Molecular Biology 120:1, 2010. See reference list at the end of the narrative.